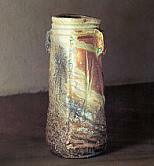 SUGIMOTO's pottery is infused with the power of spirit. 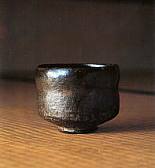 Over the years his Zen discipline has enhanced his ability to create clay works with his spiritual power. 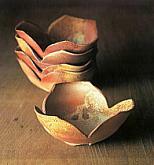 One can recognize how the natural texture of his woodfired wares makes food look better and flowers appear fresher. His teabowls bring out the deep taste of whipped powdered green tea(matcha). 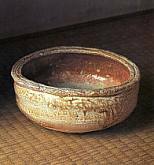 The more one uses SUGIMOTO's ware in everyday of life, the more pleasure one experiences. 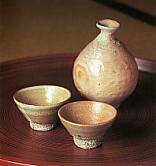 Iga and Shigaraki wares, both traditionally unglazed, are usually fired in wood burning kilns.  The wood ash that swirls about in the kiln combines with the feldspar in the clay and vitrifies, producing a natural glaze. 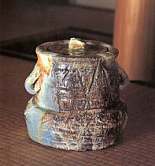 A long firing is necessary to accumulate enough ash and to raise the temperature sufficiently to achieve this effect. 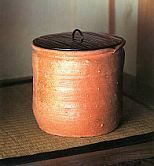 Pots are often refired when this effect is sought. 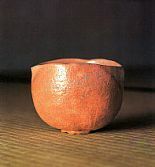 SUGIMOTO's Iga and Shigaraki wares have a quiet power and bring the grand traditions of these ancient kilns into the present.